This award-winning, VisitScotland 5 star Luxury Retreat has the perfect location for a holiday cottage in Perthshire; quiet and secluded with amazing views over the Strathearn Valley, yet only 10 minutes from Scotland's Best Restaurant, Gleneagles Hotel, Spa and Golf Courses and the Scenic Scottish Highlands. Retreat Guests enjoy the use of a fabulous wood burning hot tub which has the most amazing views over the valley, a lovely Tennis Court and free Salmon Fishing on the River Earn. As well as seasonal organic vegetables from the Estate. We have a nearby Horse Paddock so that guests can bring a maximum of two horses and a large fenced in garden for dogs. The City of Perth, Glenturret Whisky Distillery, Drummond Castle Gardens and Crieff are only 15 mins from the cottage. Scone Palace, Stirling Castle and the Wallace Monument are all easily accessible in under 30 mins as is Loch Tay and the Scottish Highlands. Edinburgh and Glasgow are both reached within an hour, making the Retreat the ideal base for a holiday in Scotland. This special Retreat is reached by private access and is surrounded by the beautiful landscape of Trinity Gask Estate. The Interior of this Gorgeous Cottage is simple, fresh and contemporary. There is a large, high-ceilinged, open-plan kitchen/living area with a stylish well equipped kitchen complete with a dining table for 8. In the living area, large comfortable leather sofas are perfect for stretching out on in front of the open fire. The Double has two windows with views west (perfect for evening sun) towards woodlands and Ben Vorlich. The super king bed is extremely comfortable and is made up with crisp Egyptian cotton linen. Both bedrooms have more than ample hanging and shelf space and come with hair-dryers. The Twin Room is very bright and large with a high-ceiling and 2 windows provide uninterrupted views across the valley. The family Bathroom has a big doubled ended bath, separate walk in Shower and is stocked with organic shampoo, conditioner, soap and body lotion. 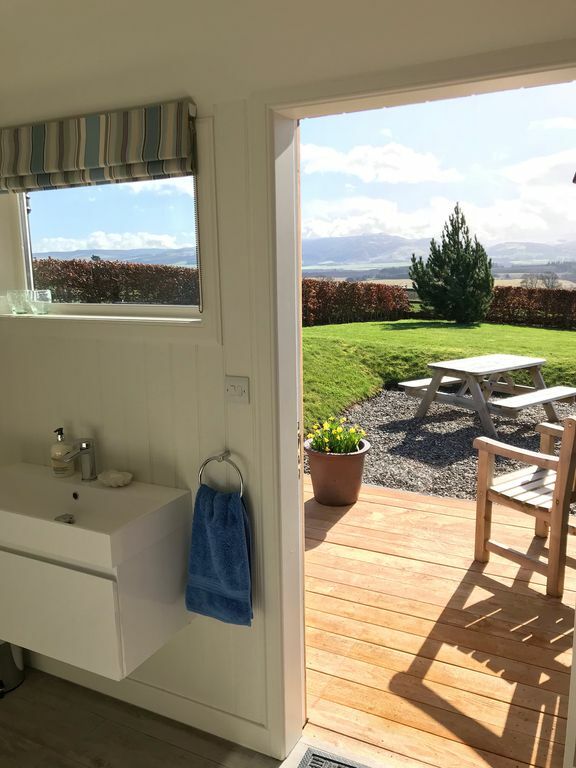 The second bathroom is an en suite shower room with a large walk in shower and gorgeous views south over the valley. There is door from this bathroom out onto a terrace which is the perfect place to enjoy the morning sun with a coffee in the robes and slippers provided.... enjoy that holiday feeling!! Adjacent to the back door is a separate outhouse/utility room, which is the perfect washing and drying room. There is a large stainless steel sink, washing machine, plenty of cupboard and hanging space, an overhead pulley and underfloor heating. Spacious, airy and warm, it is the ideal place for pets to sleep when they are not in the garden. Please note that, due to our allergy free status, pets are not allowed in the house at any time. For your entertainment there is a 37' HD flat screen TV, DVD, Ipod docking station and CD/radio player and a karaoke machine! There is a good selection of games and an abundance of touring, walking and cycling maps as well as interesting books on Scottish wildlife, history and culture. Lisa Roberts owns and manages the Retreat. Lisa lives on the Estate with her four children and husband, Jamie, who farms the surrounding agricultural land and manages the fishing and woodlands. The Retreat is one of two holiday properties on the Estate. They run a number of other successful long term let properties and wanted to give visitors from both the UK and overseas the opportunity to sample Scotland's wonderful rural life - somewhere they could come to relax, unwind and enjoy their beautiful surroundings. Lisa used to run a tourism business out of the five star Gleneagles Hotel so is very familiar with the local area; the Retreat has a wealth of information for visitors to help plan their excursions as well as recommendations for dining in the area. Both Jamie and Lisa are sociable and well travelled and enjoy meeting the many visitors who come from all over the world to visit this special Retreat in a beautiful area of Perthshire. We decided to renovate this particular property and turn it into a holiday let because it has the perfect location for a holiday in Scotland - very private with stunning views in all directions and yet 10 mins from local shops and Crieff with the gateway to the Highlands on the door step. The Retreat is an award-winning property and has a large number of repeat visitors because it is a beautiful and very comfortable house in which to relax. The location is stunning, without stepping in a car, visitors can enjoy many walks through the woodlands and along the River Earn, where they can see fish jumping, deer, pheasant, partridge and red squirrels crossing woodland trails and birds of prey soaring overhead. Guests cam enjoy the use of a new astro tennis court and also free fishing on the River Earn. The Retreat is also incredibly romantic. Couples come back time and time again to enjoy quality time together, having the UK's best restaurant 10 mins away is also a bonus! As a result, we have had many engagements happening at the cottage... both planned and unplanned!! The Family Bathroom has a double ended bath and separate shower. The large en suite shower room has a large walk in shower and stunning views south over the valley. There is a door from the bathroom onto a terrace with coffee table and chairs - ideal for morning sun and easy access to the hot tub. Robes and slippers provided. Both bathrooms have underfloor heating. beautiful private rural location with open views across the valley. Reached by private access. Dedicated drying room with underfloor heating and overhead pulley. Large, high-ceilinged living space with big comfy leather sofas, open fire and stunning views from the windows. Everything any cook could want including cook books! Stylish, contemporary kitchen with Caithness stone worktops. Dining for 6 people. Large enclosed garden with plenty of flat grass to kick a football/run around or simply relax on the sun loungers and soak up the amazing views from the garden. lovely south facing sheltered terrace with uninterrupted views over the Strathearn Valley. Stunning sunsets too! There are many golf courses within 15 minutes of the Retreat, including Gleneagles, 10 minutes away. The Retreat has its own access and is very private. There is a large fenced grass garden surrounding the property and a good selection of sun loungers, al fresco dining furniture and even rocking chairs! Fantastic accommodation in a beautiful spot, the glorious weather saw it at its best. Fantastic break every need catered for. As a local Perth boy who left 30 years ago returning with my family this location and accommodation saw this unique area at its best.. would definitely book again. We stayed for a week in the Retreat to recharge and have some much needed relaxation. The location was perfect, quiet and undisturbed with fantastic views. The cottage itself is well equipped and the new en-suite bathroom a real plus. The little extra touches like essential oils for the hot tub and Lisa and Jamie being on hand if needed, added to the experience. We toured around the local area including Aviemore, Loch Tay and Loch Lomond and visited several distilleries and the Andrew Fairlie restaurant at Gleneagles which was definitely worth a visit. We sat in the hot tub and watched the sunset and the deer emerge in the adjacent field before retreating to in front of the log fire. It was magical. I would recommend the Retreat without a doubt and will definitely be returning. Thank you so much for this great review especially as you were our first guests with the new en suite bathroom extension to the cottage. We are so pleased that you liked it so much and trusted us that it would be ready in time!!!! Delighted that you found a proper rural Retreat to relax and unwind. Everything was at our fingertips, well kept property with scenic views from the newly installed hot tub. Thank you so much for the kind review - we were very pleased that your had a fabulous Christmas stay at the Retreat and enjoyed the new hot tub!! An excellent well appointed property, well maintained. It was a six night stay and right from the start it was relaxing. The peace and quite - the views from every aspect- the thoughtfulness of the property's facilities were spot on for us. The log fire was a hugely appreciated asset ! Located where it is it is central to many of the places we wanted to visit. It is also close to the main arterial road system to get to from our home we relative ease. Our stay was in the Autumn but the property would be wonderful in the better weather with outdoor facilities AND SPACE ! We are planning to return! A wonderful property. Really enjoyed the stay. This award-winning, luxury 5 star Retreat is in the perfect location for a self-catering holiday cottage in Perthshire, Scotland. The exquisite cottage is reached by private access and is surrounded by the beautiful landscape of Trinity Gask Estate with its private woodlands, ponds and fishing beats on the River Earn. With stunning views south over the Strathearn Valley, it is a haven of peace and tranquillity, yet only 10 mins from Auchterarder with its impressive selection of shops, cafes and restaurants. The Retreat is also 15 mins from three of Scotland's top restaurants - fine dining is never far away! The world famous Gleneagles Hotel Resort is on the doorstep with spectacular golf courses, one of Europe's best spas, equestrian, falconry, shooting and off-road driving schools. Andrew Fairlie's, a 2 star Michelin restaurant with Scotland’s first and only Grand Chef Relais and Chateaux award, is also located at Gleneagles, a 10 minute drive from the Retreat. Perthshire's largest city, Perth, a pretty market town on the River Tay, is conveniently located only 15 mins away as are the Glenturret Whisky Distillery and Drummond Castle Gardens near Crieff. Stirling Castle and the Wallace Monument are an easy 30 mins drive from the cottage. Scotland's capital city, Edinburgh, Glasgow, St Andrews and the scenic Highlands are all within an hour of the Retreat.